Antibiotics are often used in modern animal production and it has been estimated that the consumption in the food animal sector will increase by two-thirds between 2010 and 2030. Similar to the situation in humans, antibiotic consumption has been shown to increase the risk for carriage or infections with resistant bacteria in the animal population. In most cases, antibiotics are administered to healthy animals for growth promotion or prevention of disease rather than for therapeutic purposes. There are great variations in antibiotic use in animals between countries, which cannot be explained only by differences in animal species and production systems. Antibiotics are sometimes used to compensate for poor farming practices and are expected to improve production. However, it is possible to combine high productivity with low use of antibiotics, as has been shown for example in the Nordic countries and New Zealand. Resistant bacteria are frequently found in surveillance programs within the farm animal sector. These bacteria have the possibility to spread to humans, by direct contact and indirectly, for example via the food chain or contaminated water. For example, this is well known to occur with MRSA in swine farmers. Also, similar resistance genes have sometimes been detected in food samples and patients within the same geographical areas, as described in the recent reports on the mcr-1 gene that confers resistance to the last-line antibiotic colistin. Today, we don´t know the magnitude and importance of transmission from animals to humans for the increasing resistance rates observed in human pathogens. Increased awareness among professionals and consumers, surveillance systems for animal antibiotic use and resistance, alternative measures to prevent disease (e.g., vaccination and improved animal husbandry) and availability of diagnostic tools are cornerstones in the future work to promote rational antibiotic use in animals. 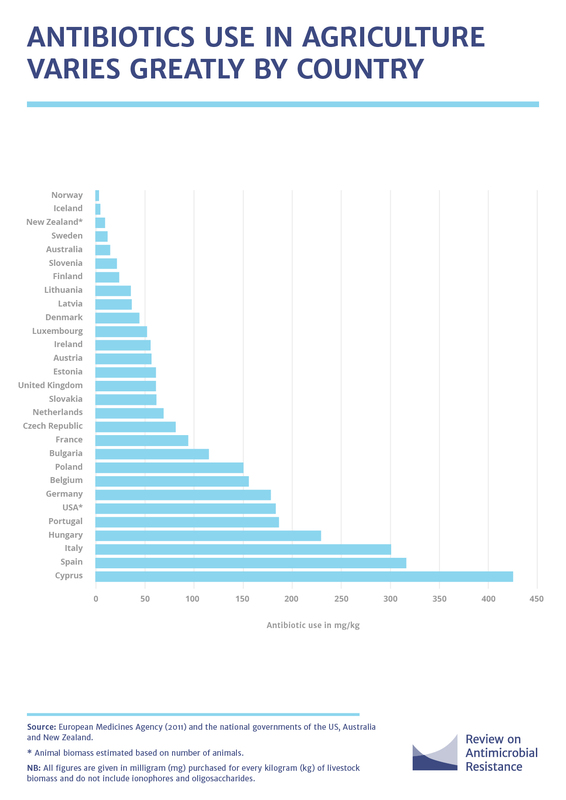 Regulations on antibiotic use, such as a ban of antibiotic growth promoters and restrictions on routine mass medication, are powerful tools that are being discussed and already implemented in many countries. How can we balance the need for intensified animal production worldwide and the need to reduce antibiotic use? Should certain antibiotics of importance for patients be restricted to humans? If yes, by which criteria should such restrictions be made? Below, you’ll find links to a report and an infographic by the Review on Antimicrobial Resistance. There are also links to the articles ‘Food Animals and Antimicrobials: Impacts on Human Health’ by Marshall & Levy and “Antibiotics in agriculture and the risk to human health: how worried should we be?” by Chang and colleagues. Chang et al. Antibiotics in agriculture and the risk to human health: how worried should we be?